David Grealy is a 1st year PhD student studying history at the University of Liverpool. Born in Lancaster, England, he enrolled as an undergraduate at the University of Liverpool in 2011. After graduating with a BA (Hons) in history, he decided to continue his studies in Liverpool by undertaking an MA in twentieth-century history. Although the merger of intellectual and diplomatic history has intrigued him for many years, the study of human rights, and the influence exerted by the concept in a diplomatic setting, emerged as his particular area of interest during his Master’s degree. 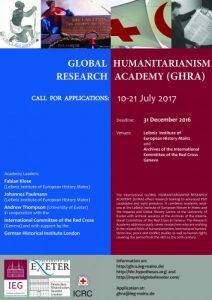 This entry was posted in Posts and tagged GHRA 2017, Human Rights, Humanitarianism, ICRC, International Humanitarian Law by Fabian Klose. Bookmark the permalink.